I wrote on my other blog last year that I can always count on getting a message from John Lopinot on May 4. Usually the subject line says it all: Never Forget. May 4, of course, is the day that four Kent State students were gunned down by the Ohio National Guard. What would cause this look? The short answer is opportunistic politicians. I had expected this would be the year when I would do the definitive piece on what a small Ohio university town was like in the months leading up to the shootings and the days afterward. I wasn’t at Kent State, but in Athens, Ohio, the home of Ohio University. 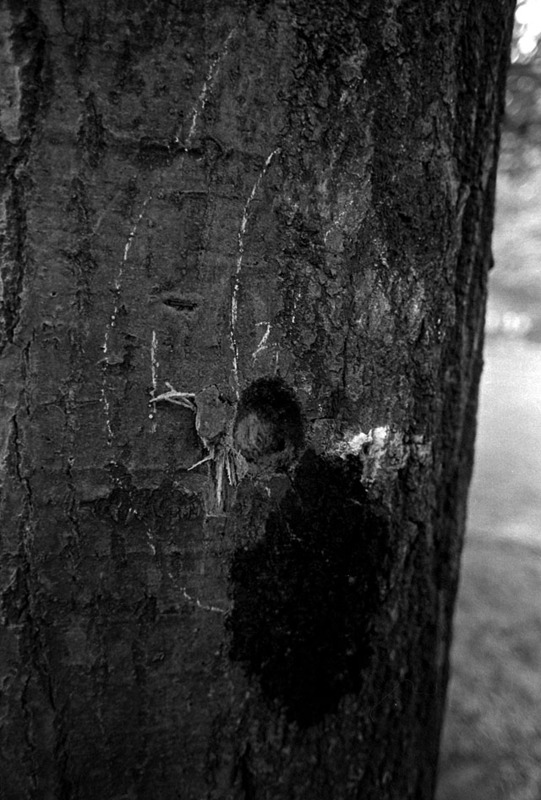 At two in the morning, I was looking at 545 scanned negatives and a stack containing at least that many more. The best I can do for the 40th anniversary is to hit some of the high spots. It’s hard to remember how torn apart this country was in the late 60s. The country was polarized by age divisions, by feelings about the Vietnam War, by economics and by race. Opportunistic politicians promoted those rifts for their own advantage. 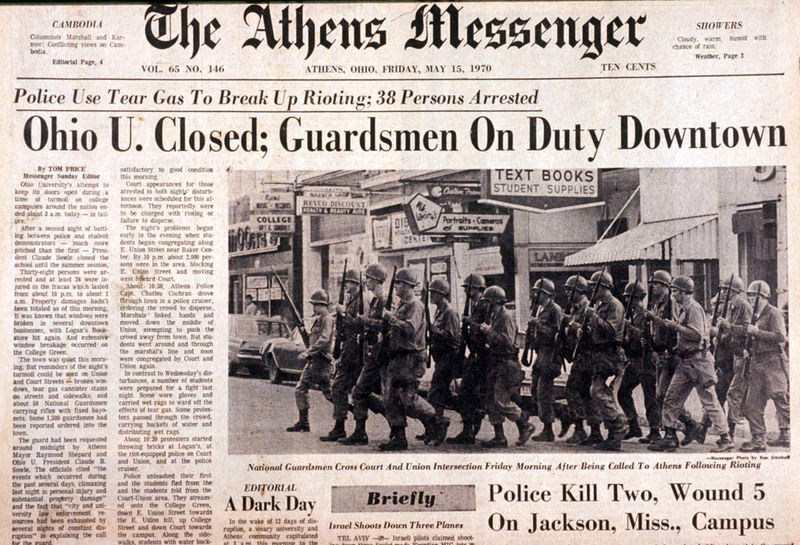 Athens religious leaders led a peaceful, non-violent march down the main drag in Athens on a beautiful October day in 1969. 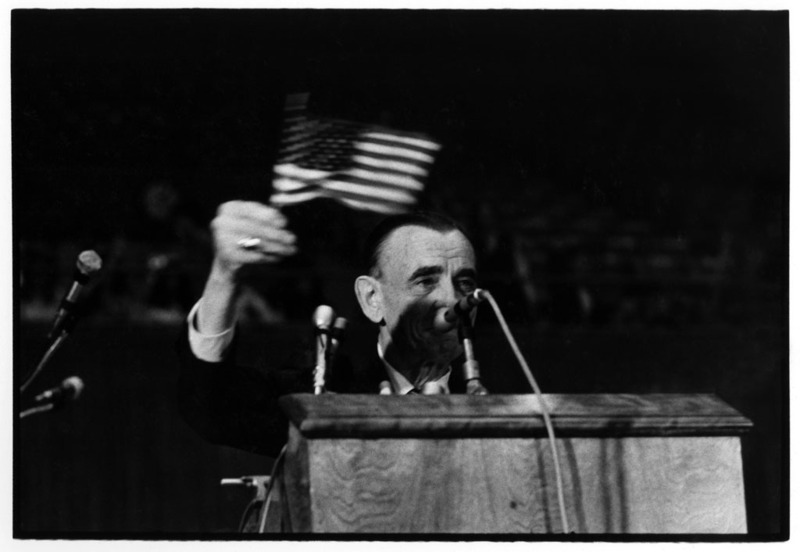 (My film sleeves are dated Oct. 16, 1969, but that might have represented when I processed the film, because Wikipedia says Moratorium Day was celebrated on Oct. 15.) The ministers and these children were at the head of the line. The garage with the glowering man was on the parade route. I didn’t even notice that frame when I edited the film 41 years ago. Maybe I was so used to seeing that reaction that it didn’t register then like it does now. 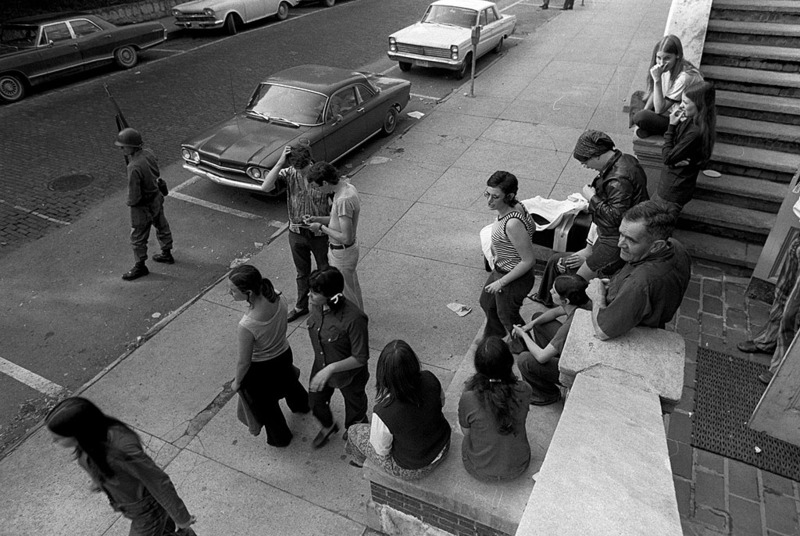 Moratorium Day – a day to take off from work or classes and think about the war – was centered on the College Green in the heart of the campus and downtown Athens. It’s a beautiful setting with huge trees all around. The crowd ebbed and flowed throughout the day. It may have ranged from a few hundred to maybe a thousand at any one time. There were a number of speakers, all forgettable. The thing that has haunted me since that day was a relay of volunteers reading the names of the servicemen killed in Vietnam. 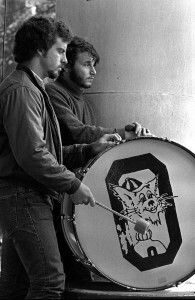 Every name was accompanied by a drumbeat on a drum with a smiling OU Bobcat mascot on its side. If it takes about two seconds to read each name, you need about 24 hours to work your way through 50,000 names. The sound system wasn’t strong enough to carry the names much farther than the immediate area, but that drum beat was audible throughout most of downtown and the central area dorms. Even if you couldn’t hear the names, you couldn’t escape the realization that every beat represented someone just about your age who was dead. Photographers gravitate to action. 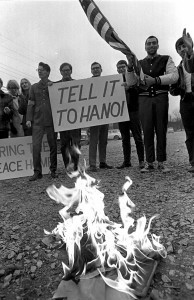 TV, in particular, has the slogan, “If it bleeds, it leads.” Demonstrators learned to play to that with marches, demonstrations, signs and street theater. The war seemed to be winding down by the spring of 1970, and student activists were starting to shift their focus to more domestic issues. That changed when Nixon announced on Apr. 30, 1970, that he was going to have American forces invade Cambodia. Reaction on campuses was swift and angry. Vice President Spiro Agnew, who later resigned in disgrace over petty bribery charges, escalated the rhetoric much as Nixon escalated the war. At a Republican fundraiser in Miami, Agnew recommended that campus dissenters be treated as if they were Nazis. 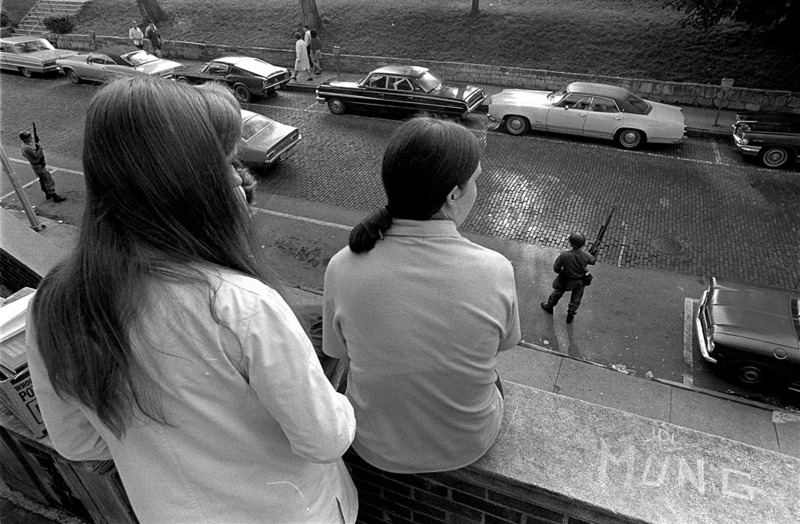 If you click on this sentence, you’ll be taken to my account of the day the Kent State shootings occurred. 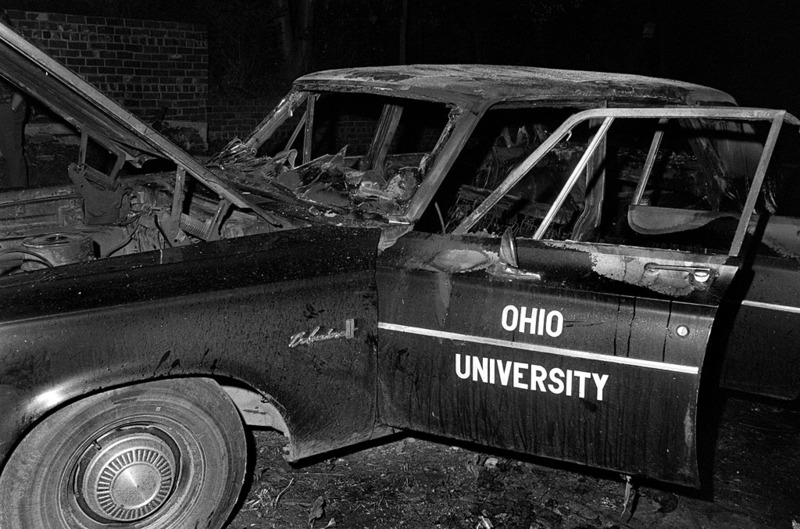 Students at Ohio University were stunned by the killings. One of the largest groups I can recall seeing turned out on the College Green to hear speakers and to be close to one another. The group wasn’t made up of your “usual suspect” campus radicals and protesters. 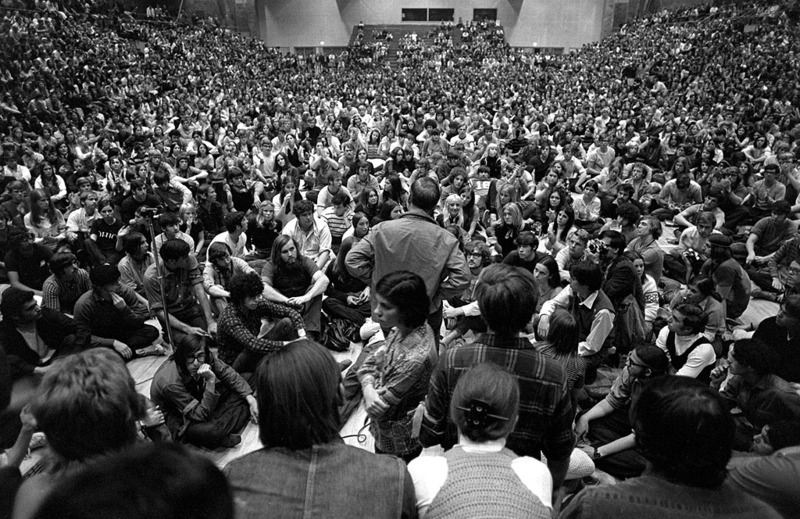 Faculty members and Greeks were sitting side by side with long-haired hippies. 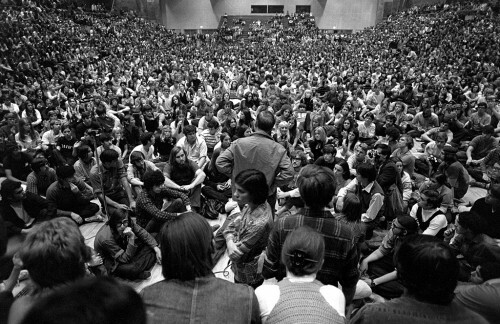 Another mass meeting was held in the Convocation Center, usually used for basketball games. Speakers, including university president Claude Sowle, lined up for their turn to speak. What I find astounding looking at these pictures today is that President Sowle (standing, in jacket, with back to camera) was surrounded by thousands of students without any security present. That speech was widely broadcast, including into the National Guard’s bivouac area on the Kent State campus, something that was thought to give tacit approval, if not encouragement, to the shootings that would happen the next day. Rhodes was two days away from a tight primary race and he was hoping to fire up his base. Some of the campus religious leaders announced a one-day fast in honor of the Kent State victims. It would be broken by the taking of Communion on the College Green the next day. After having attended a Lutheran school for eight years, I always associated Communion with golden chalices, fancy wafer, droning organ music and great formality. There were so many students participating in THIS communion service that the ministers had to dispatch someone to a nearby store to pick up some cheap bottles of wine and some loaves of ordinary bread off the shelf. I usually never participate in the events I cover, but I understood, for the first time, the real meaning of communion. It wasn’t about the religious trappings, it was about coming together with something bigger than yourself. I got in line for a chunk of bread and a swig out of a shared bottle of wine. I was never so moved by a religious ceremony before, and I’ve never felt like taking Communion since. I don’t know if it was the place, the people or the circumstances, but something special happened that afternoon. Almost every day there was some kind of rally, march, demonstration or protest. Most of them were fairly benign. It was almost like no one wanted to push the envelope too far after what happened on May 4. 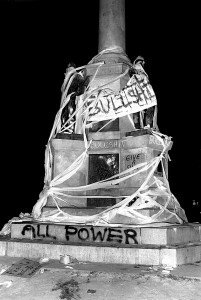 Even the night-time bonfires next to the War Memorial seemed fueled more by alcoholic spirits than the spirit of revolution. 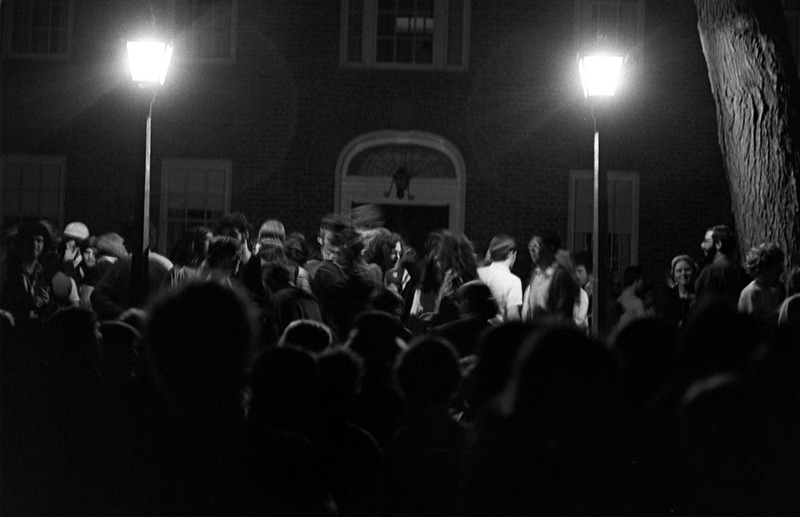 Ohio University has long celebrated The Rites of Spring where confrontations with local police were common when the first warm days chased the cold winter away. 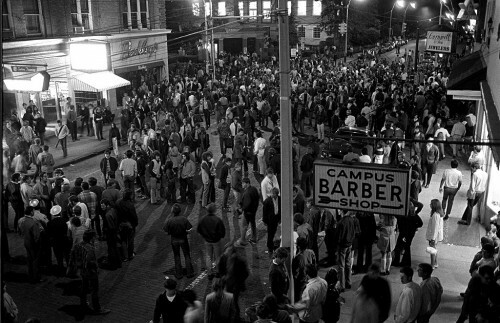 When the bars let out on a nice spring night, it’s not uncommon for the students to take over the major intersection in town at Court and Union. On this night, there’s some political tension in the air, but there are no political signs and no organization. 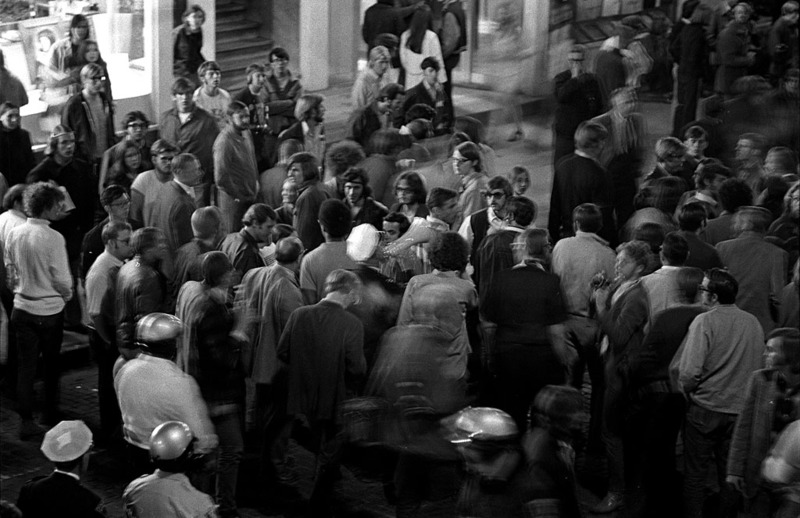 It’s a crowd, not a mob. The officer in the center of the photo with the white hat uses a bull horn to tell the group to disperse. That’s commonly known as “reading the riot act.” It’s all part of the Rites of Spring ritual. Everyone pretty much stayed withing the Rules of Engagement and nothing unusual happened. Police and students all seemed on their best behavior. At some point during the week, Chubb Library was occupied by the students. 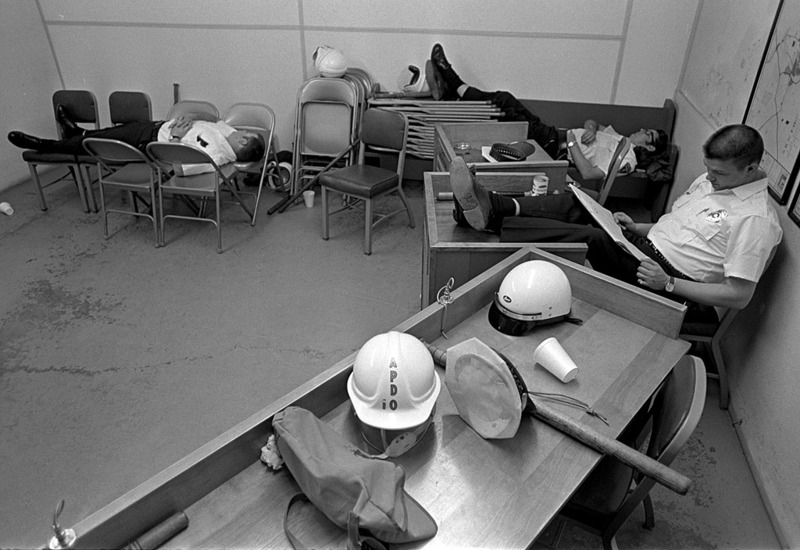 Some of the reporters and photographers decided that we would stay in the library during the brief siege. We figured the students would be less likely to trash the place if we were there to record it. We also assumed the police wouldn’t storm the building if we were there to photograph any head cracking. We were keeping both sides honest. There was one last half-hearted night of protest that involved a relatively small crowd that marched on the president’s home. I don’t recall much happening and the group started to disperse. Other newspaper folks and I had the feeling that this was about the last gasp. The movement was running out of steam. Even students get tired. Students started running back to the group saying that the Green was surrounded by police who were keeping them from leaving. To this day, I think this was a result of bad intelligence on the part of the police or bad planning. 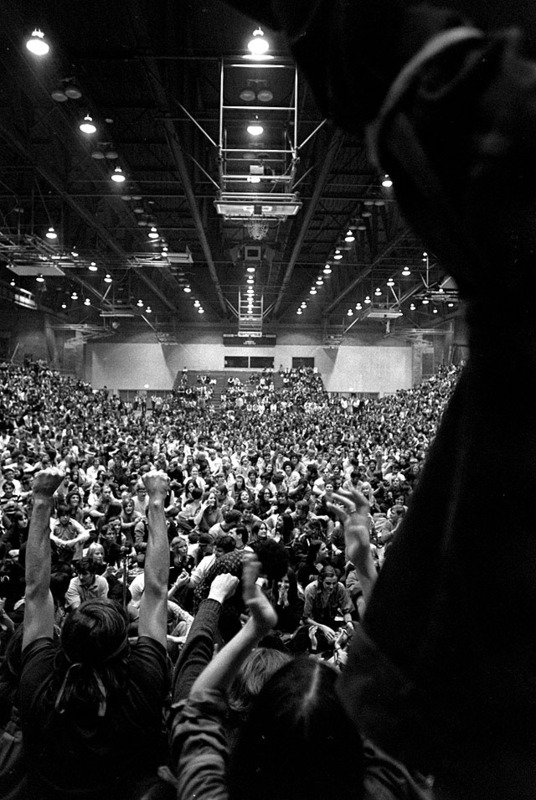 I don’t think they realized that the energy was gone from the student movement and that it was about to collapse. If they had allowed the students to disperse on their own, everyone would have gone home and it would have been over. 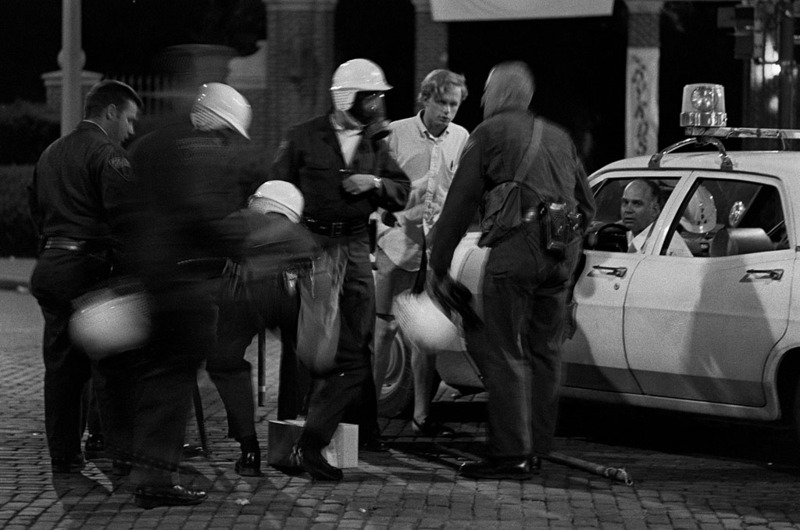 To make matters worse, I discovered that police from all over the area had been brought in for reinforcements. These folks rarely had contact with students and were even more poorly trained than the Athens PD. It wasn’t a good thing to see everyone decked out in full “bats ‘n hats” riot gear with gas masks. I don’t think I had ever seen Athens PD use gas before. Like I described on my other blog, it wasn’t long before a cop I knew launched a tear gas grenade right toward me. It gave me great pleasure to give him a grin before I pulled on MY gas mask. 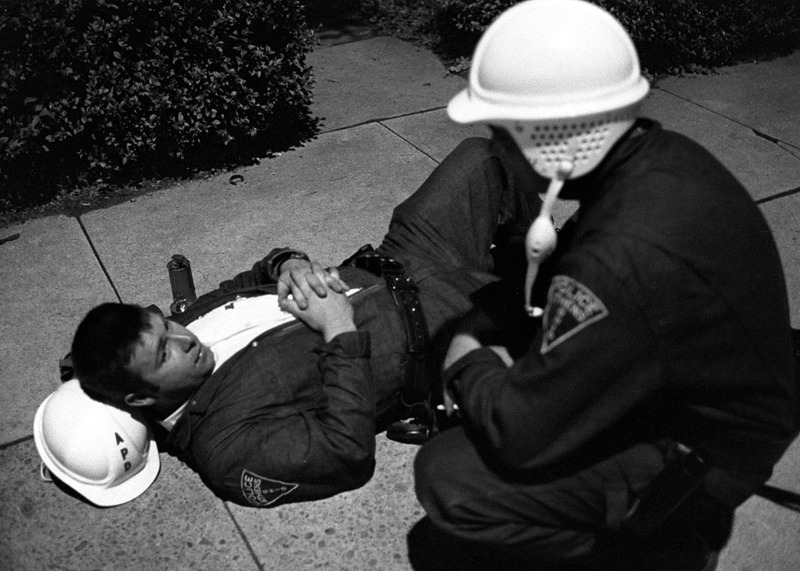 Friend and photographer Ed Pieratt shot me in my riot gear. I had to wear my glasses on the outside of the mask because I was blind without them. 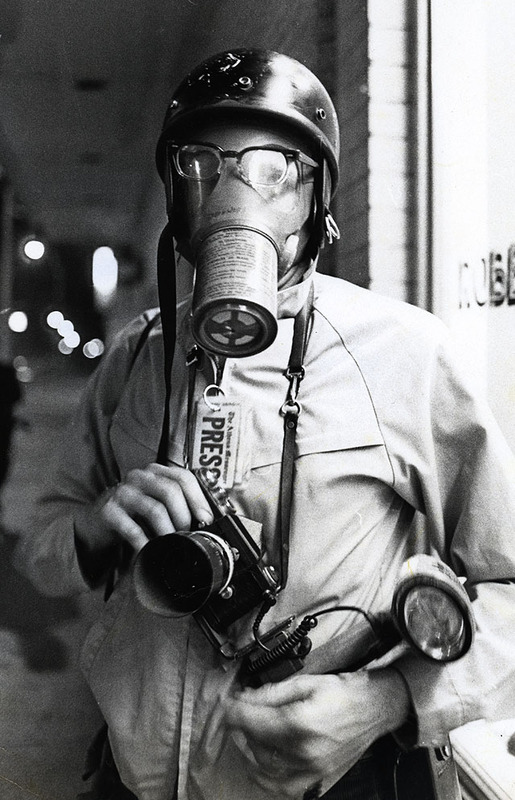 The old WWII mask kept the gas out, but the lenses fogged up so badly I couldn’t see WITH the mask or WITHOUT it. 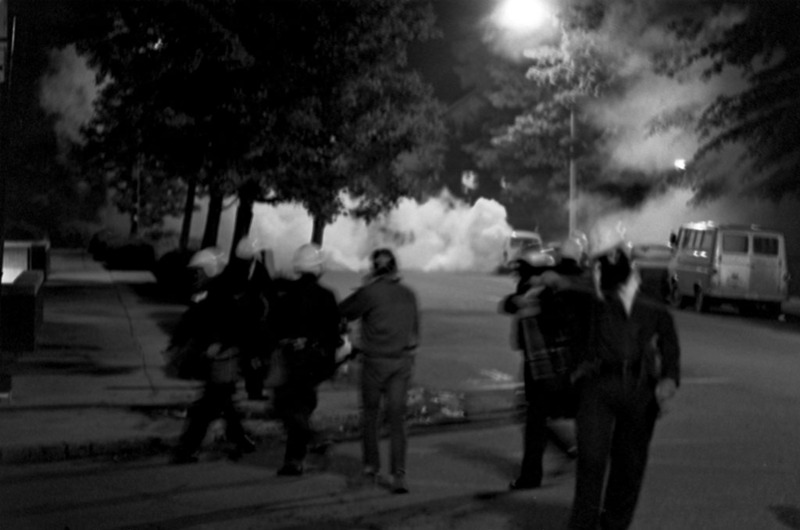 (By the next riot, I had a state of the art M16 mask courtesy of a policeman who “liberated” one for me. I had it fitted with prescription lenses and used it for another two decades. I’m not happy with the photos from the night of the riot. For some reason, despite the fact that I specialized in shooting available light under lousy conditions, and despite that stuff I had shot by street lights earlier in the week looked good, I decided to bolt a flash on the camera. Shooting flash draws attention to you – and can look like a muzzle flash from a gun – so you tend to shoot sparingly. It also makes for ugly pictures. Photographers shouldn’t think, they should shoot. Having that bleeping flash on the camera made me think, which caused me to miss photos I wish I’d had. It was over. By morning, President Sowle had made the decision to close the university until the summer session. Mayor Raymond Shepard and President Sowle decided jointly to request the Ohio National Guard. 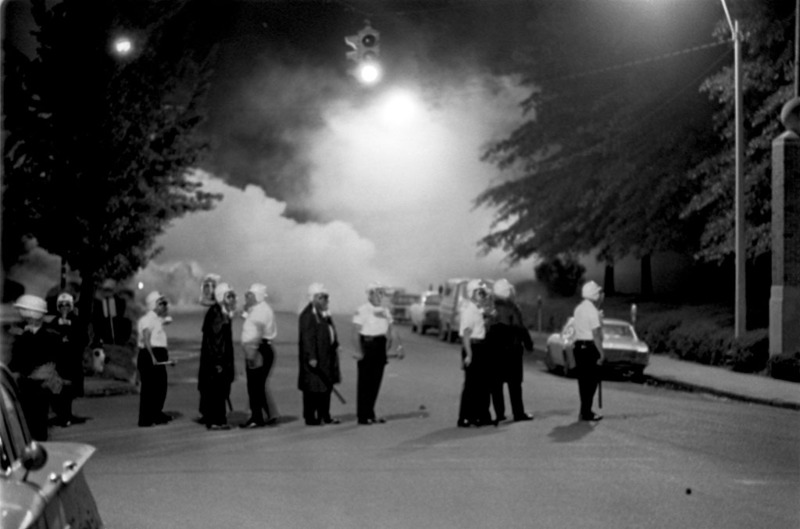 With tear gas power still falling from the trees and the whole town suffering from red, itchy eyes from the night before, carloads of anxious parents descended on Athens to pick up their kids. On the front page of The Messenger that detailed the closing of Ohio University is a story that has been dwarfed by Kent State: the killing of two students and the wounding of five at Jackson State University in Mississippi. Think of that the next time someone on the left or the right loses touch with reality. Words can sometimes ignite more than the political base. Excellent piece, Ken. It was like dominoes falling. Kent closed. OU closed. A lot of those students made their way to Oxford – and Miami had to close. 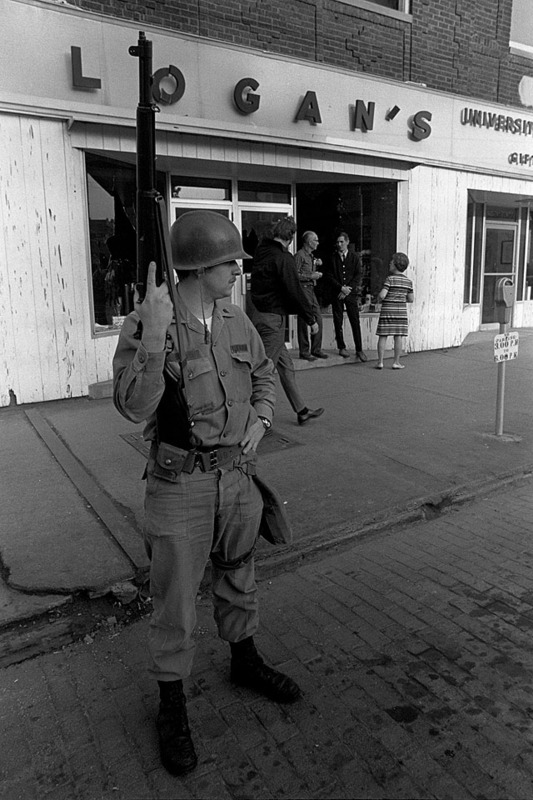 We had been through our sit-in, arrests, National Guard crisis a couple of weeks before Kent happened. Just when we were almost settled, everything went nuts when Kent happened. It was an amazing spring. And then ten days later, the shootings at Jackson State. It was interesting, enlightening, frightening, polarizing at the same time. Sort of like today’s Congress… Thanks for your “Never Forget” posts. The scary thing is, I can hear the same drumbeat starting up again. I don’t know if anyone is going to get down to the bottom of the piece, but the important message is the we have to dial back the hate rhetoric before we turn loose something that will take us back to the bad old days of political assassinations. Let’s debate ideas, not demonize our opponents. To paraphrase, those who forget the past are condemned to repeat it. I don’t want to go through it again. Nice job Ken. It brings back memories, and leaves me wondering why I can’t remember other things, and makes me want to forget others. I’m remembering the photo I used full size before the elections; No Choice, on hundreds of crosses on the green. It was the end of my relationship with the paper and Kenner. He made me use wire pictures the next day, chosen by the news desk. I stepped over his line, and it was his newspaper. 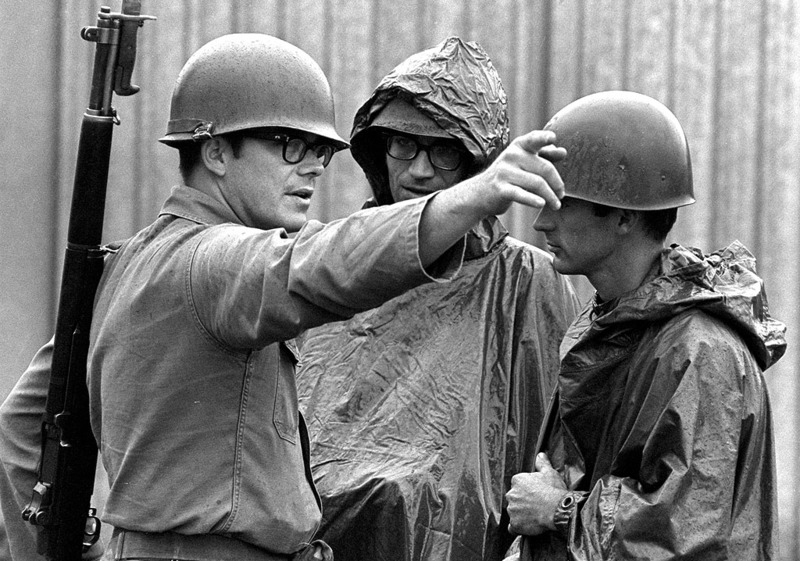 I thought about that picture when we were lost in Laos last November; both Johnson and Nixon bombed neutral Laos unceasingly in the secret war. A hundred or more Lao are killed each year, 40 years later, by the anti-personnel bombs that still come to the surface. We could have been killed by one of them since we were deep in the uncleared jungle along a branch of the Hoh Chi Minh Trail. I wondered what Kenner would have thought had I been killed 40 years after that picture. Would he then think the picture had been worthy of publishing? I don’t mean to be unfair, and I do understand his point of view. But it was the end of my career as a photojournalist. That’s the part I don’t want to remember. That is why I wasn’t out there with you. I realize your focus in this piece is away from Cape, but I’d like to hear recollections of the Kent State aftermath from those who were then at SEMO. 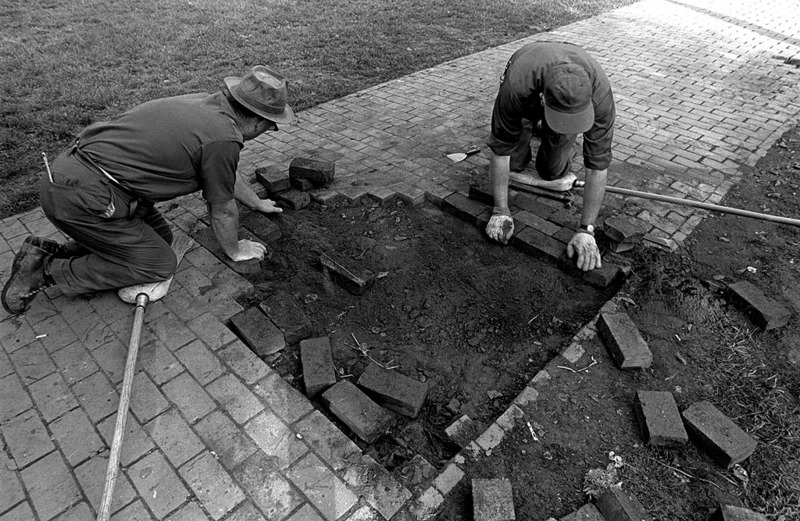 At that time the trustees prided themselves in maintaining a tuition affordable by almost everyone in the District, and in doing so attracted quite a number of Vietnam vets from elsewhere. There was even the XGI fraternity. I was, obviously, away at that time. I remember covering the first teach-in at SEMO in probably 1965 or ’66. 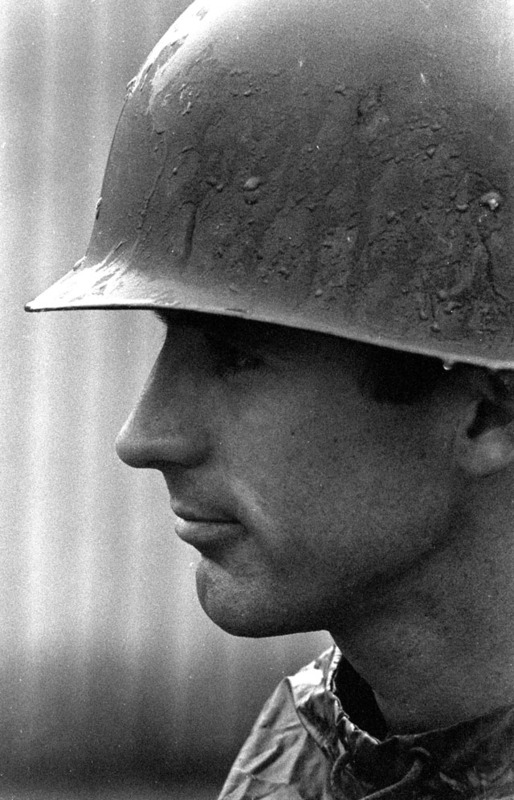 I went back to the office and told Judy Crow that I thought the anti-war side won the morality argument, but the pro-war side was the more practical. If I had to score the debate now, knowing all we’ve found out since then, I guess I have to give the match to the anti- side. Wow – just wow! This brings back bad memories, all right. I was teaching in Fairbanks, Alaska during this period of time. The students were from all over the U.S., a melting pot that boiled over into conflict whenever the student council had an assembly. 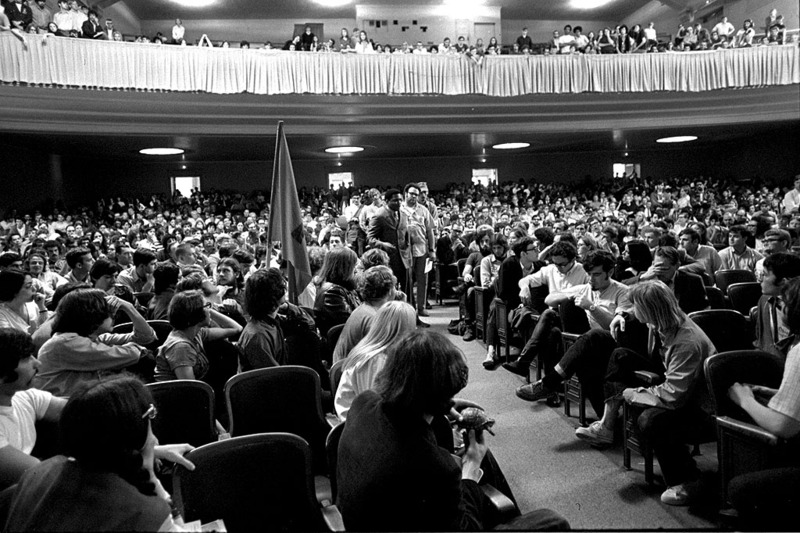 My first year there, I was found myself surrounded on the balcony by a screaming bunch of bare-foot “hippies,” yelling, “Pigs!” “Tools of the military establishment!” The other teachers faded away, and I was by myself. When the kids yelled “You can’t trust anyone over 30!” I wanted to say, “Hey, I’m 28!” but I knew it would do no good. The last year I taught there (73?) 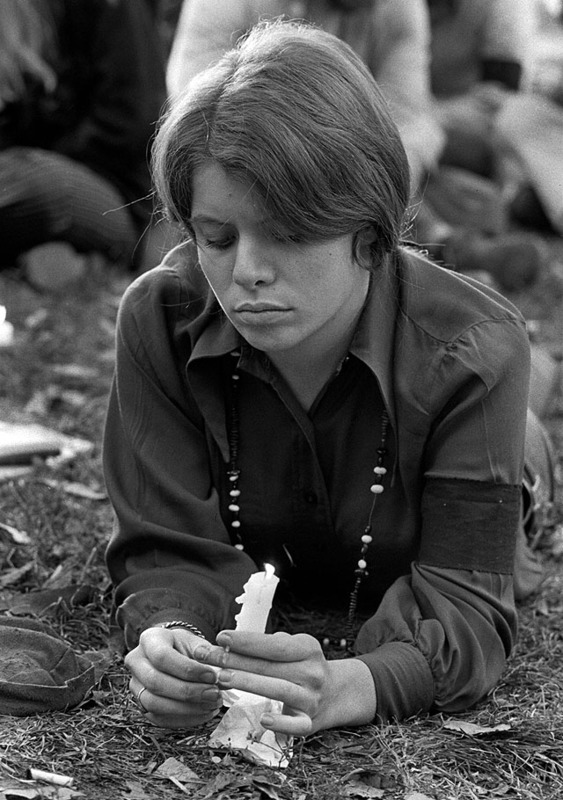 some of the students were already fearing that Kent State would be forgotten. “Kid, you’re in for a ride,” I told him. “Wow, that was pretty neat,” he acknowledged. Then I gave him a stack of books to look through that covered the era and I dug around for my old photos. We went up to the office and did a bunch of copy slides of the result. The next step was to sit at the dining room table with a tape recorder while I told a bunch of war stories. The final thing was to put together the music and the interview. We didn’t have any way to synch the photos and audio, so he had to practice enough to know when to push the button for the next slide. I still have the tape. It’s so crudely done that it’s almost painful to listen to, but I’m sure that’s one kid who won’t forget the 60s. I never heard from him again. I’ve often wondered what kind of grade he got. As I see the wagons circling over the immigration storm, healthcare rage spewing from so many, our energy sources contaminating the ocean, and big business plundering opportunity for change, it takes me back to the dynamics you so brilliantly display above. Thank you for this text book reminder of how life was in those times. “Those who forget history are destined to repeat it”, the saying goes. May we never forget. And….may we not be revisiting those divisive times. Thank you for a brilliant piece of work! Thank you for this wonderfully executed, moving piece about an important juncture in our history. As I mentioned earlier, I was at University of Wisconsin-Madison at this time where the National Guard and local police got it right–walking that fine line between maintaining safety and allowing free speech. 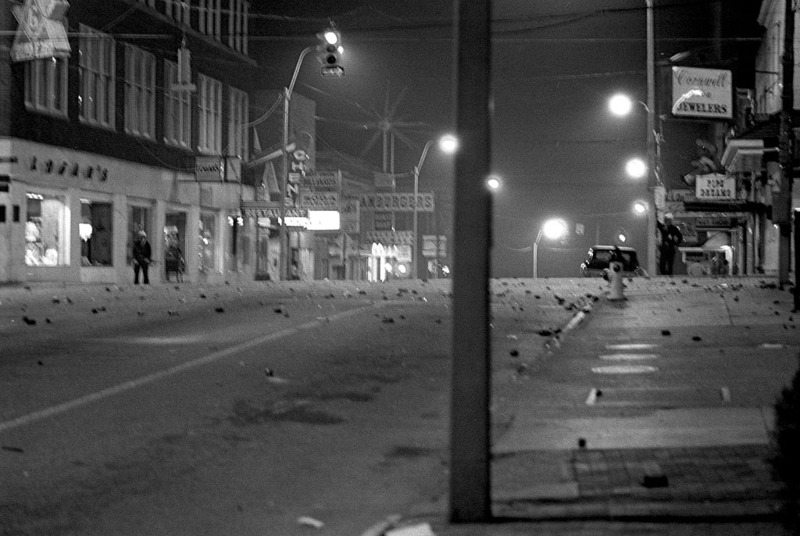 There were the usual uses of teargas and a few arrests when things got too unruly, but that was all. 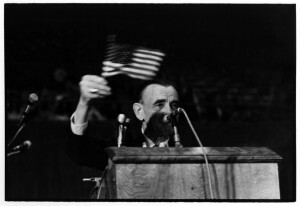 Years later, one of the protest leaders went on to serve as Madison mayor. 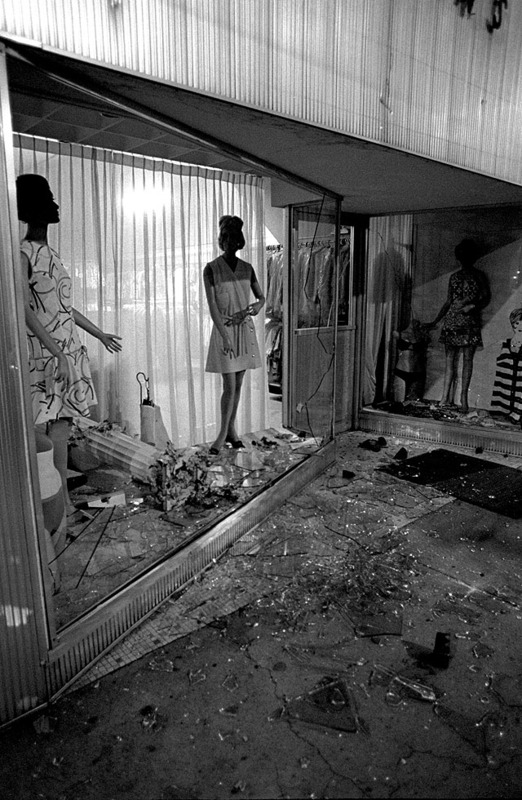 In August of 1970, all the peace was shattered when the Sterling Hall bombing occurred at night and a young researcher who was working overnight tending his experiments was killed, illustrating clearly to me the difference between civil disobedience and terrorism. I have no issue with civil disobedience so long as you are willing to accept the consequences of your actions. I had no sympathy for someone who did something and then immediately starting asking for amnesty. I was walking on campus with two cops one day when a guy dropped a concrete block off a roof, just missing us. When they caught the guy, I told him that it was a good thing I wasn’t a cop carrying a gun, because I’d have shot him for trying to kill us. 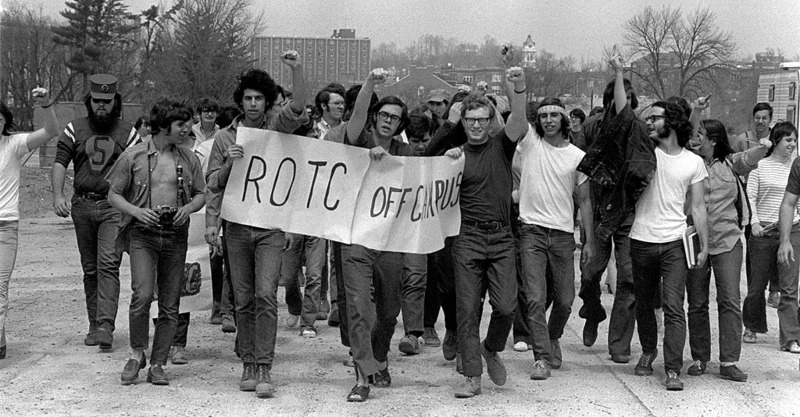 As an ROTC cadet that Spring, I remember the abuse we took – and gave. 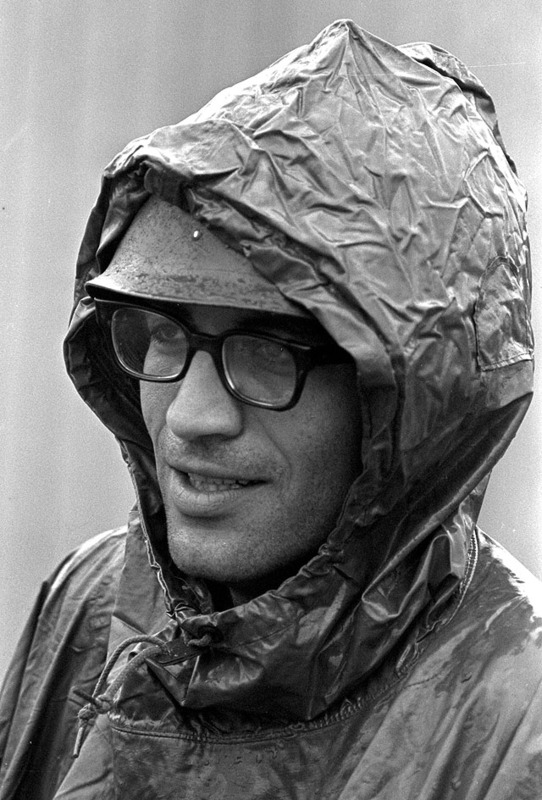 Unlike most eastern schools, mine did not close after Kent State. We wound up the semester as scheduled. This included the ROTC graduation parade two weeks after the shootings. Unlike previous years, this one attracted much of the campus, partly blaming us for having exams. 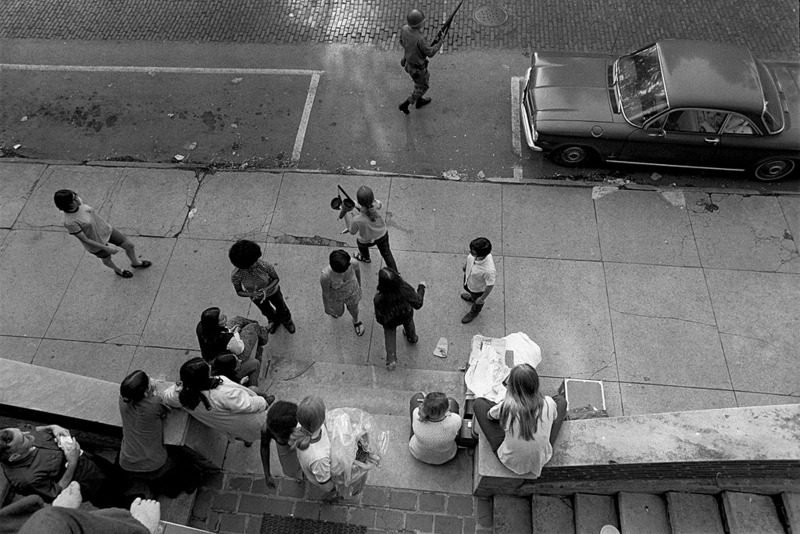 As the crowd gathered early at the stadium it seemed the majority were armed – with water balloons and sagging brown bags. Not seeking to wind up his carrer in the headlines of the local paper, the colonel asked me to volunteer for a mission befitting my reputation (which he had winessed not long before at the Military Ball). There was no refusing. A bit after the appointed time for the parade I marched in uniform with company flag – but no rifle – onto the stadium field and took a position on the 30 yard hash mark. 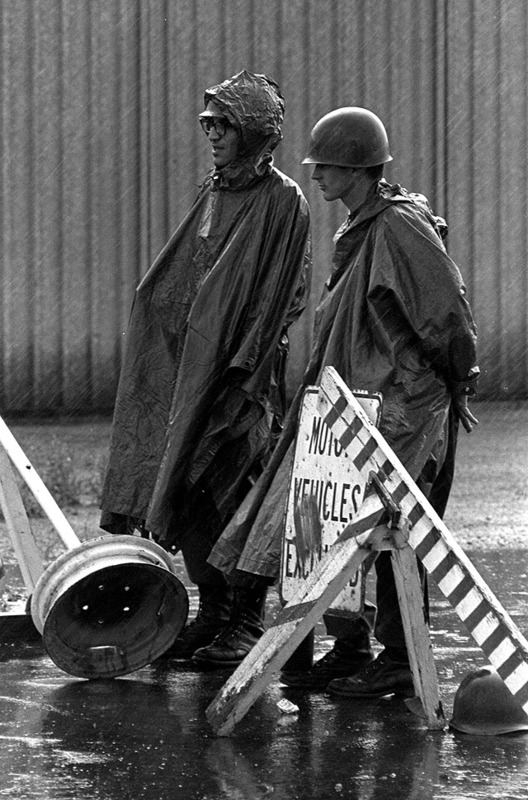 There I stood staring at the hundreds of folks milling about on the track or seated in the bleachers with their Boones Farm awaiting the rest of the Battalion. Eventually, a long haired friend of Jesus ran onto the field shouting that the activities were proceeding in the field house. I never moved, but was quickly forgotten. By the time the rabble made a decision to move, my compatriots were headed back to their lodgings – smiles on their faces, thankful for the truncated turn of events. And I was forgiven by the colonel for past transgressions – that year. I think you deserved a mettle medal for “volunteering” for the special duty. I was an RA in one of the east green dorms. 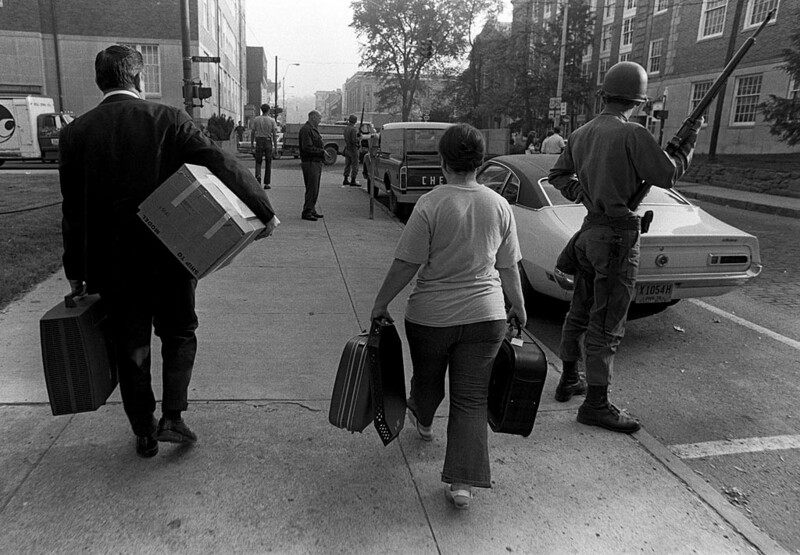 My most vivid memories, are our being directed to lock the doors at some point, with tear gas filling the streets, and not to let students back into the dorm. Then, after school closed, watching the Guard troups and Athens police comb through the large piles of valuable stuff left behind by students(type writers, appliences etc. )forced to vacate their rooms. We had to throw it away as we cleared out their rooms. 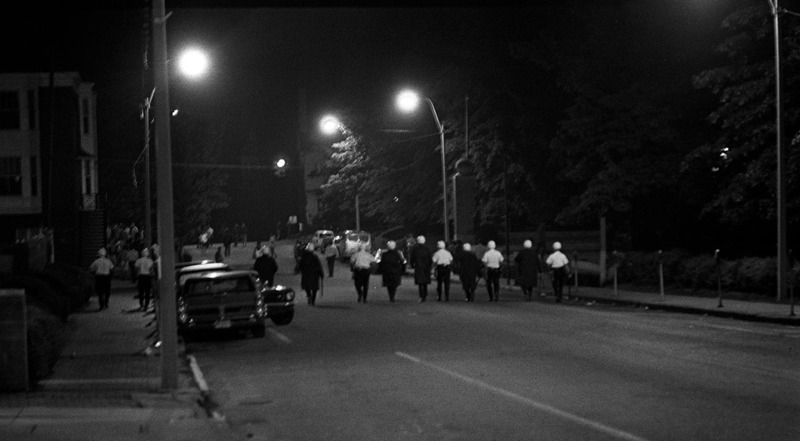 In the evening we went to the movies, “Z” was playing, passing the Guardsmen lining the streets. I remember the movie “Z” well. One of frames of the guard deploying after the one that ran in the paper showed the marque with Z on it over their heads. I had never thought about all of the stuff left behind. One thought that crossed my mind when I looked at the girls leaving their rooms with a couple of suitcases was that this was clearly before the years of monster sound systems, tvs, microwave ovens and all the stuff that would be there today. Another thing that caught my eye was the lack of cell phones and cameras in those group shots. That’s worth a whole discussion in itself. Ken, thanks so much for bringing me news of the 1970s. I have lost that entire decade, probably because our two sons were born in 1970 and 1972 and I was consumed with their care. I know I didn’t watch much TV (except for Sesame Street and other kid programs) because the boys were usually where I was and I didn’t want them exposed to the events of the day. Our older son has a deep interest in those news makers and the Vietnam “conflict.” He considers it “his” war much as I did WW II. I’m not from this area but Ken invited me to comment anyway, possibly because we worked at the same newspaper for many years. I was at the University of South Carolina. 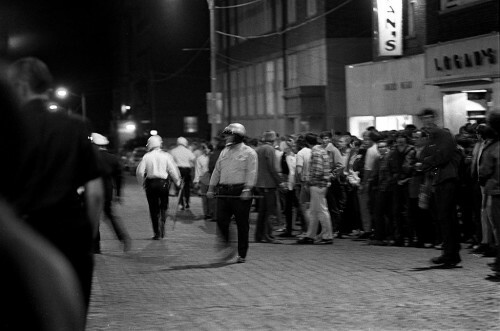 We had much the same – mass protests, a few random police beatings and tear gas on the college mall. The Greeks threw firecrackers from their dorms at the state police sent to occupy the campus. That struck me as a typically Greek response, high on drama but low on thought. I was amazed they weren’t fired upon. 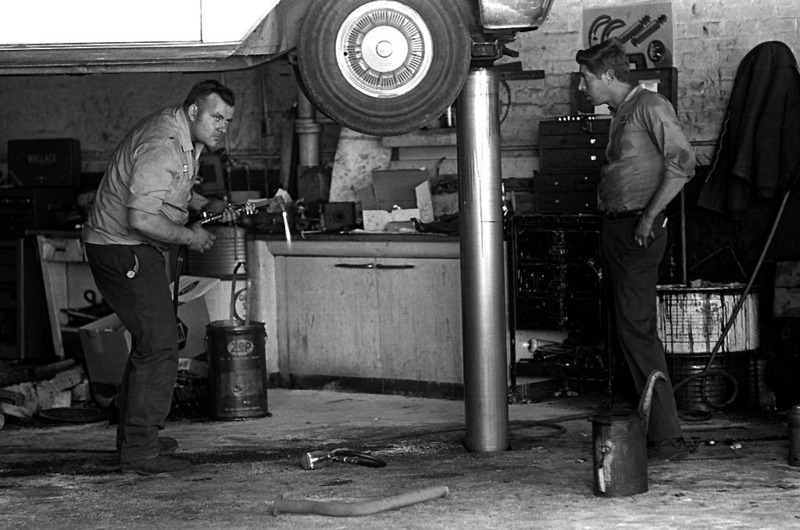 The state’s response was typically pugnacious and ignorant. 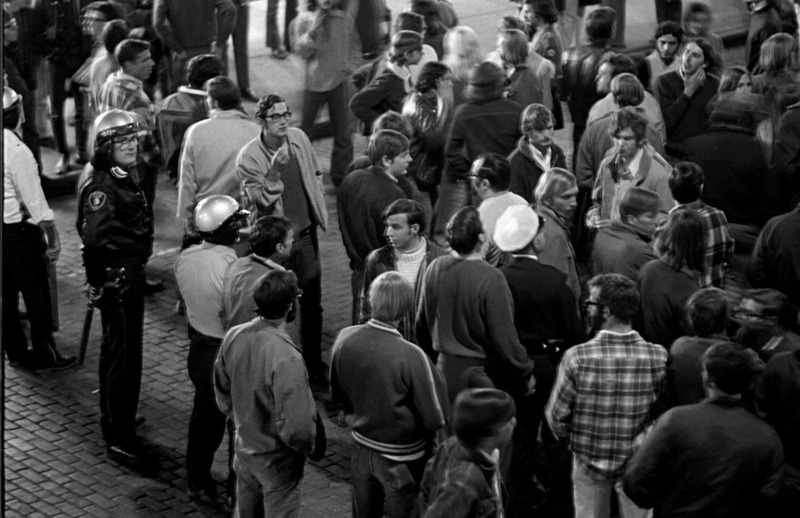 I was among a handfull of students who met with South Carolina’s governor during the troubles. He told us that the whole thing was caused by 217 Communist agitators on campus. The man couldn’t have found 217 Communists if he trawled the entire state with a shrimp net. In fact, one of the protest leaders was a girl I dated in high school. She was trying to stop the killing, not start a revolution. In answer to the question “When will they ever learn?” my forty years of experience since indicates “not anytime soon.” This is unfortunate for all of us. I was a freshman at OU in 1970, getting ready to start fraternity Initiation. We had to run the gauntlet to get to the FIJI house that night. Police drove by and threw tear gas onto our front porch. 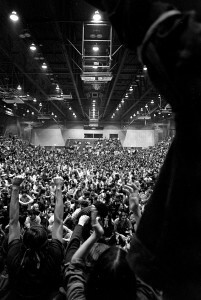 It was an insane night. Your pictures take me back to that night, hard to believe it was 40-years ago. Hopefully nothing like this will ever happen again! I appreciate being able to see your photos. Thank-you for posting them. 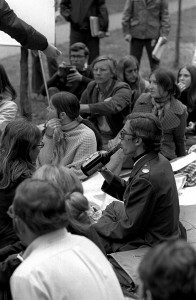 I was at the University of Wisconsin in 1969 – 1971. 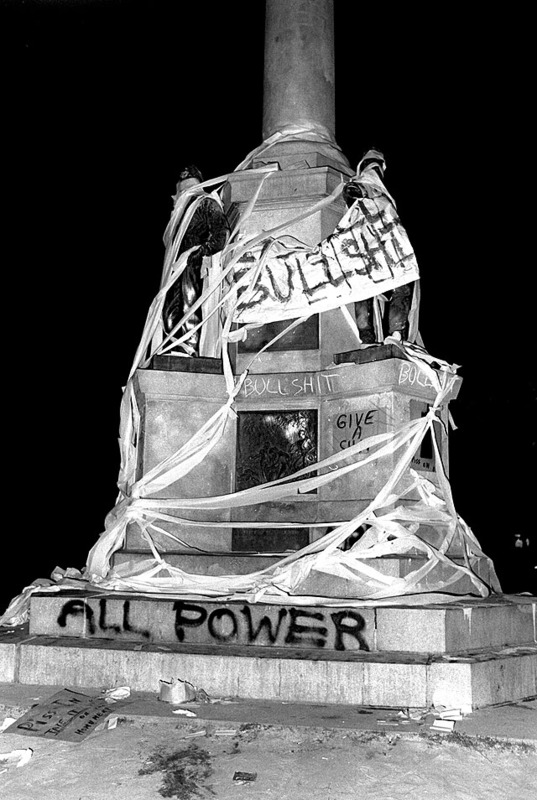 I remember what happened at Kent State and what happened in Madison. If you travel down State Street today near the Chocolate House you may see bricked store fronts with little round windows. Anyone in the glass business was making quite a profit from the demonstrations. I had just finished a course on the IBM Composer in the IBM building on a Friday (I believe) before it took a bomb. I worked for the State of Wisconsin Public Instruction Department on school text books and we were in a high rise by the lake that more than once received pepper gas. I remember being on Bascom Hill in the College of Letters and Science Building when demonstrators came in to hold the “establishment” at cobra point. 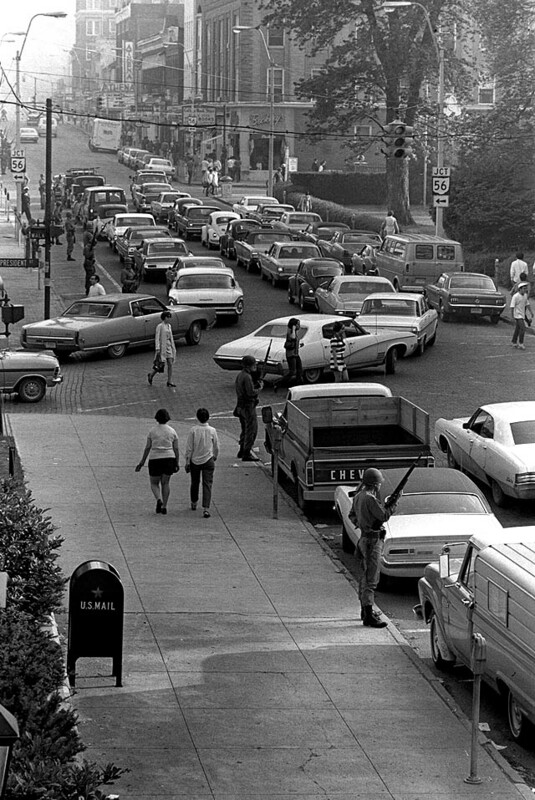 I remember walking home because bus transportaion was at a stand still all the way up to the capitol building. 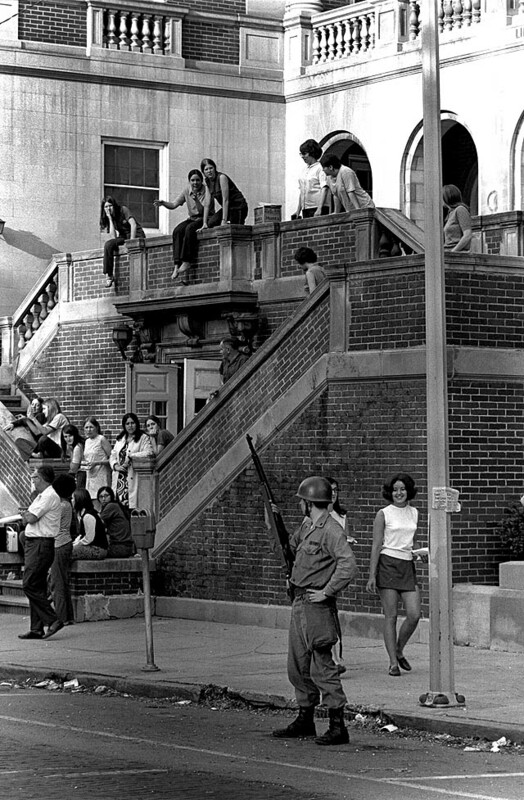 I remember walking by National Guard soldiers in front of dorms with their guns readied and seeing burning over turned military jeeps on campus lawns. I remember the day the University Medical Center took a bomb. I remember walking across campus and getting caught up in a Black Panther riot where one of my room mate’s car was being stoned as she and friends were looking for various ones of us on campus. I remember another room mate and I taking off running through a drug store to get to safety and and finding we were in step with a young man and a policeman. The young man must have tried to distract the policeman by running with us. We made it inside a dorm. I don’t know what happened to the young man. My room mate ran out of gas one night while we were on campus. We literally had to search for any station that would let us have a can of gas … because of all the fires being started. Because I had inner peace that I was to be in that city at that time … I amazingly was unafraid. Sometimes in the middle of it … it seemed like I was just watching history taking place. Despite all of this chaos … life went on. It was in this city that I ice skated on my first old fashion pond. Nearby I learned how to ride various sleds on the dairy farms and how to milk a cow. And I enjoyed jogging by the beautiful city lakes and water skiing. And speaking of history … decades later … I stood in shock as we received a call in Tulsa that the Oklahoma City bombing had just taken place and the Journal Record building had also been hit. We were being asked to print their newspaper that hadn’t missed an issue in I think 100 years. If not 100 … it was still a lot of years. Days later as you probably watched President Clinton and the Rev. Billy Graham hold memorial services in the city, I sat in the audience with my press pass behind the families holding the teddy bears in place of their children. I had been comforting the counselors that were worn out from all the emotions they had had to give. I was hanging in there until they walked out with the teddy bears and then my tears started like the levy was breaking on the Mississippi. Once again … I felt like I amazingly was first hand watching history in action. Years between these two historic happenings, I stood in front of the Viet Nam Memorial in DC thinking about the sacrifices of many of you my class mates. I ache for you and your families and say a sincere thank you. May God bless you and God bless America. Thanks for sharing that. It’s amazing how many things folks from our age at Central have seen. I’m glad to have experienced many of those events and emotions, but I would equally just as soon not go through them again. Somehow you missed catching me on the streets of Athens. I was there — on furlough from the Army. Loved the photos and insight. Gave me goose bumps reading and looking at it. Photos and comments carried me back to those days. As a foreigner I could not leave town, so they had us all gathered and placed in a dormitory with no exit permit untill the Athens Ohio “stage of siege” would end. Much like the “stage of siege” in Athens Greece during the same period, Spring 1970! 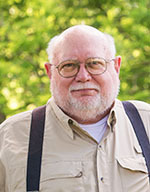 A special tribute to Government Professor Rober Hunt, because in his masterful political science courses a 19 year old foreigner could attain the analytical tools to understand what was going on in all of the Athenses of the world. I was in the School of Radio and Television — Ohio University Class of 1969. My (then future) wife (OU Class of 1970) and I were at some of those events, although by May, 1970 I was directing the 6:00 and 11:00 PM news at Channel 4 in Columbus, and she was student teaching. I worked at the station during summers, and used to shoot news film for them while school was in session. 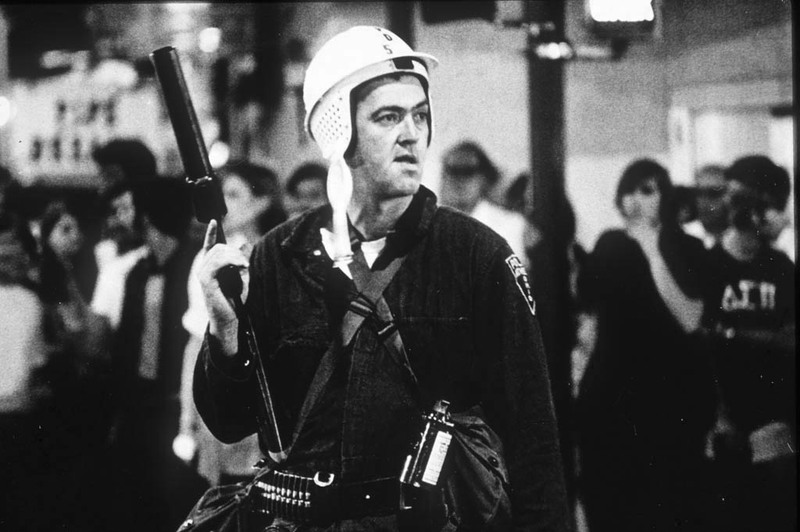 I shot many of the demonstrations between 1967 and 1969. I kept a couple of rolls of 16mm color film in my refrigerator and used a WOUB camera. I remember Ed Pieratt, whom you mentioned above, and Clarence, who commented above. 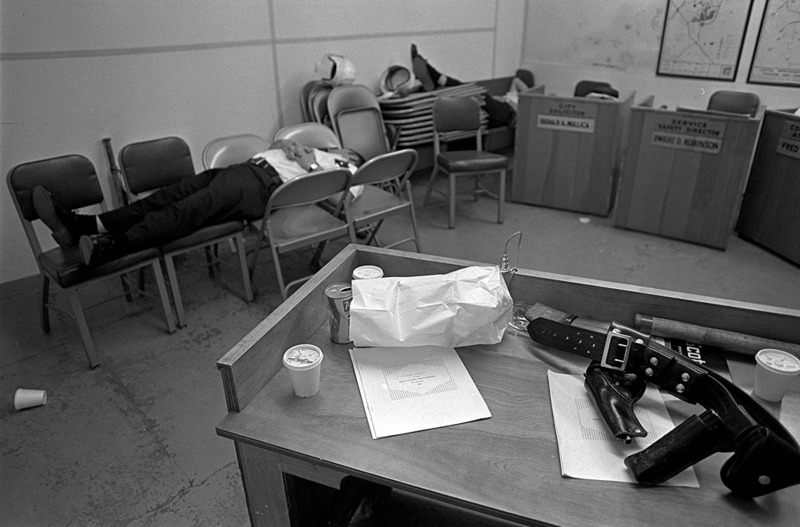 It’s way to simplistic, I know, but I wished then, and still do today that Governor Jim Rhodes and Gen. Sylvester DelCorso had been tried for murder. It’s funny that I was recently asked about Kent State be some of the younger folks at the TV network where I now work, and telling them that those were both the best and worst possible time to be in college. Thanks for reposting Ken. Do it every year. I graduated from OU last year… this site gives me a whole new respect and perspective for my alma mater. Thank you for all of the information and the amazing photos. Thanks, Devon, I suspect OU is a lot quieter campus than it was in my era. I’m currently working on a book for the Athens County Historical Society and Museum on the closing of OU in 1970. It was really a wonderful happenstance that I came across your website and I was hoping I could acquire your pictures as well as your story from that time. The museum is not only lacking in written documents of that May, but also photographs of what happened, and what you have here is an amazing collection. Let me know if you would be willing to let me use your photographs as I would like to credit you for them. And as you were right there on the ground when everything happened, I would like to get your input if you would be willing. This really is an amazing collection of pictures, and has been helpful for me as a historian to actually get a more accurate visualization of what I’m writing about. I was a freshman at OU in the Spring of 1970 and will never forget the time. 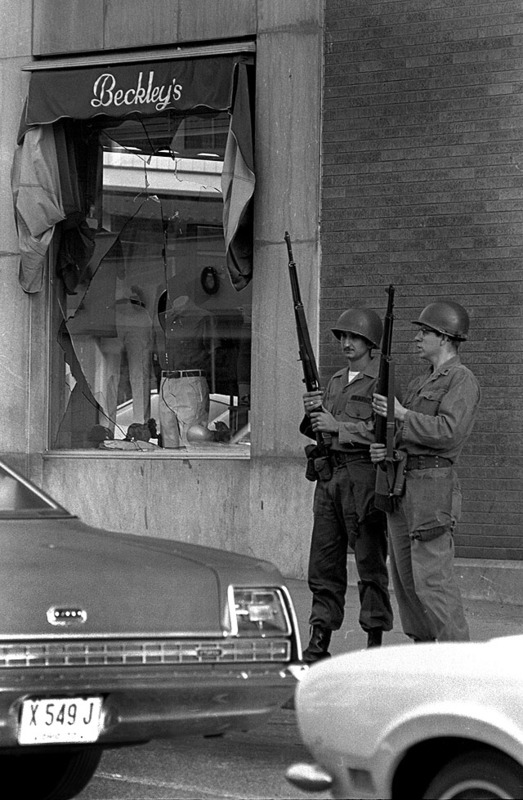 I remember standing in front of a store on Court St reading the UPI teletypes about the Kent State shootings. When school closed we were given a short deadline to be gone. You could not get a phone line to reach your parents to have them come get you. I borrowed a BSA 441 Victor to ride to Nelsonville where I was able to make the call. Thank you for posting these pictures. 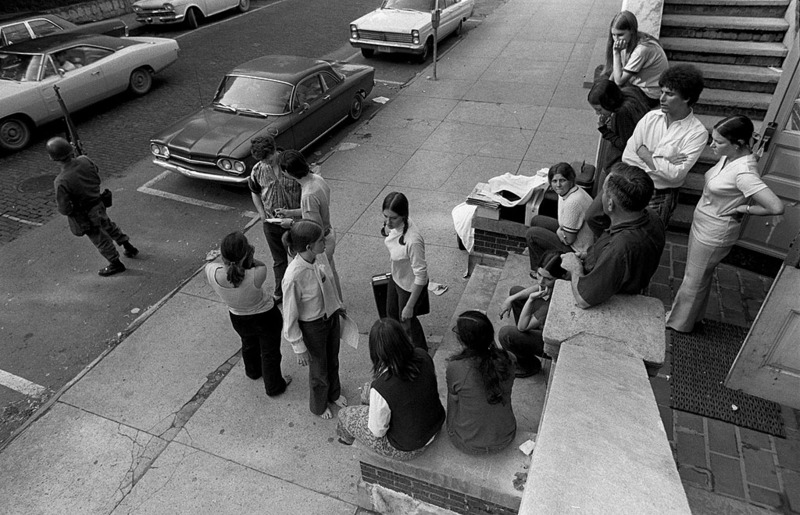 I was also a freshman at OU in the ’69-70 school year and also recall the teletypes posted in the window of the College Book Store with the latest news about Kent State. grew up 20 miles from KSU and had many friends there. We were at a party on the outskirts of town on Thursday (teargas night) and, with the roads closed into town, had to weave our way through back roads to get back to our beds. Walking down College St and near Jeff Hill, I got caught in the gas clouds and recall very well its effect. We were told that if we weren’t off campus by noon Saturday, we’d be arrested. 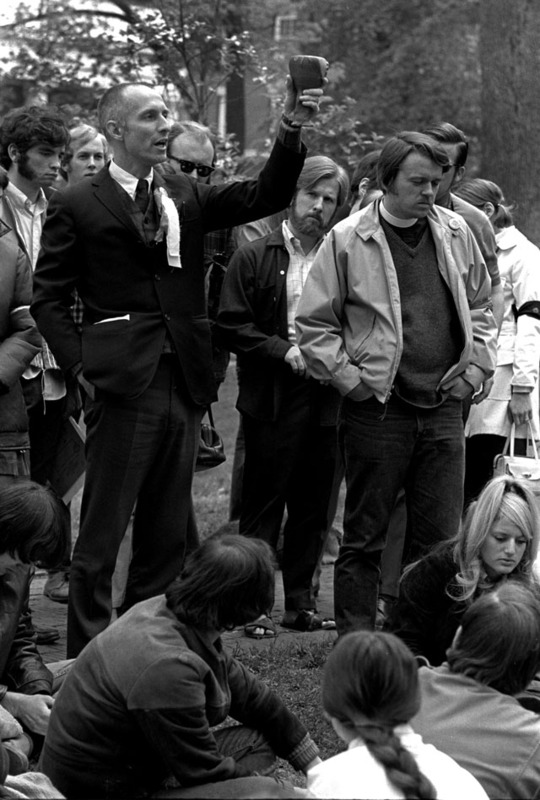 As a follow up, prompted by “The Truth About Kent State”, a federal grand jury was empaneled in December, 1973. I was selected to serve and, for 3 months, commuted to Cleveland and back. 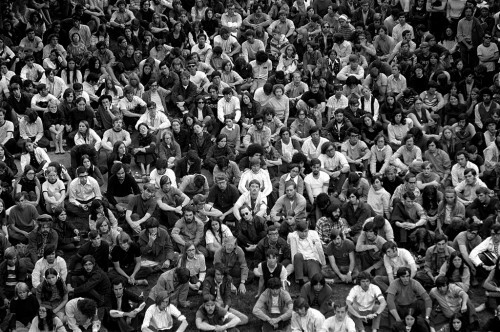 I was one of only two (of 23) who were students on 5/4/70 (the other was a community college student, not a campus resident). 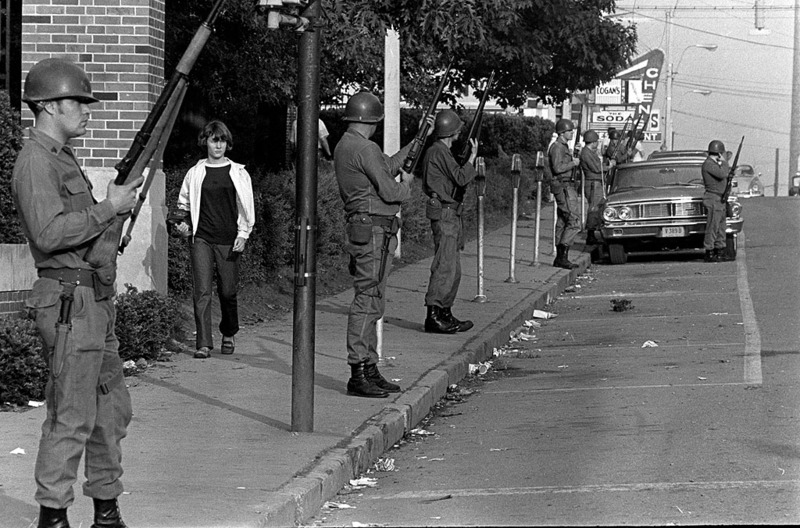 The consensus on day one was that the students got what they deserved, but at the end of our work, the vote was 18-2 to indict the 8 guardsmen. 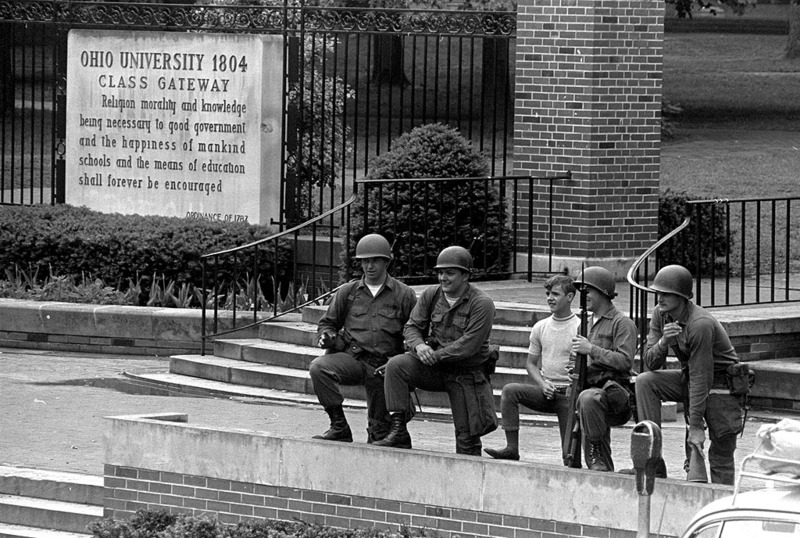 While it was true the students’ civil rights were clearly violated, there was ultimately insufficient evidence to convict any single guardsman. It was tragedy for all involved. 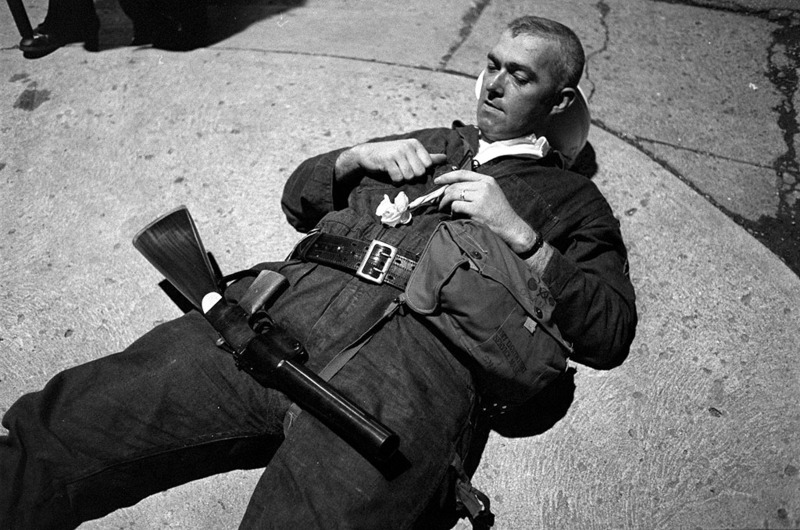 The guardsmen were exhausted, having served for weeks on duty at truckstops to prevent shootings by striking steel haulers, they were poorly equipped for riot control (M-1 rifles are lethal combat weapons) and none had prescription lenses in their gas masks. The were frightened, couldn’t see and panicked. We never could identify a command to “fire” and this question has never been answered. I believe the final legal solution was the right one, although I personally believe at least one guardsman intentionally killed Jeffrey Miller, who wore an obvious shirt and was a clear taunter of the guardsmen. While I may or may not be correct, it was at least a very lucky shot with a .45 to hit Miller in the throat at the distance he was from the firing line. I don’t believe any other guardsman intentionally tried to kill a student although some did state their intent to wound (FBI statements, Ohio State Patrol reports). I took a very active role on the jury, and personally questioned nearly every witness, including Governor Rhodes, Robt White (KSU president), the State Adjutant General and every guardsman that was called. I even had an offer to work at Fed Justice as a research analyst, based on the relationships I made with Robert Murphy and other officials, but didn’t want to live in DC. I was not an anti-war protester. I was an art major at OU with long hair — and a Greek. I voted for Nixon in ’72. What a contradiction! People who weren’t on campus during those years have no idea of the attitudes and mores of the day. I’m proud of my kids today and their values. 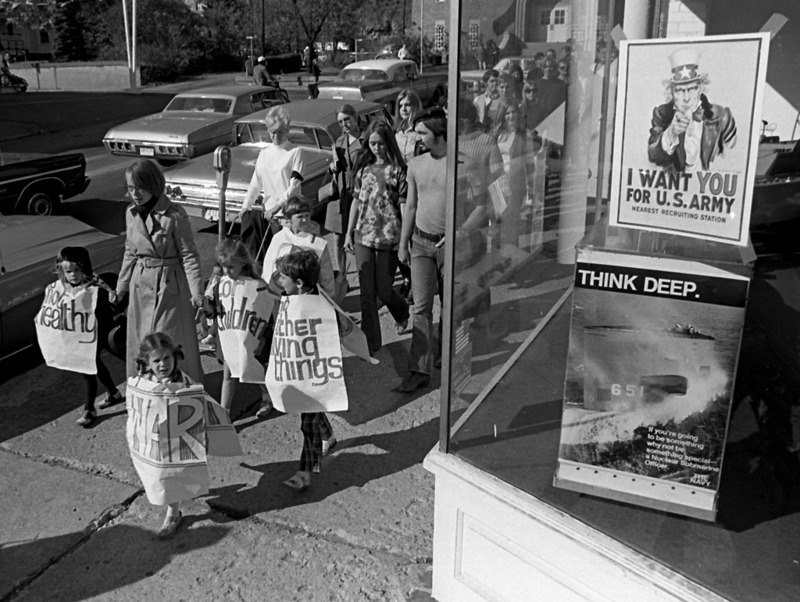 While much good came from the anti-war and civil rights movements, the movements had a destructive side that was exploited — and continues to be, diminishing the positive progress we’ve made. Thank you for posting the pictures and bringing back those memories. 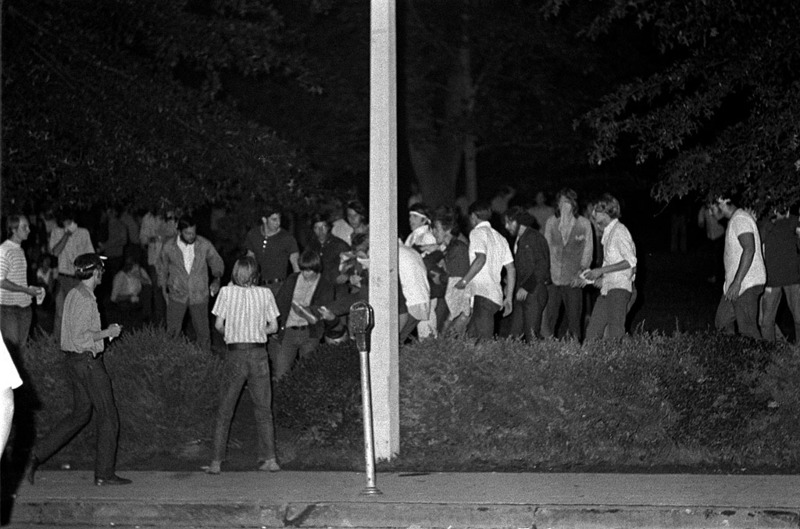 Like I said, most people today have no idea…300 colleges closed in May of ’70 due to riots? Are you kidding? May God bless us, and may He bless our country. We needed it then and we need it still. I met my wife to be on the college green weekend of the kentuckey derby in 1970. 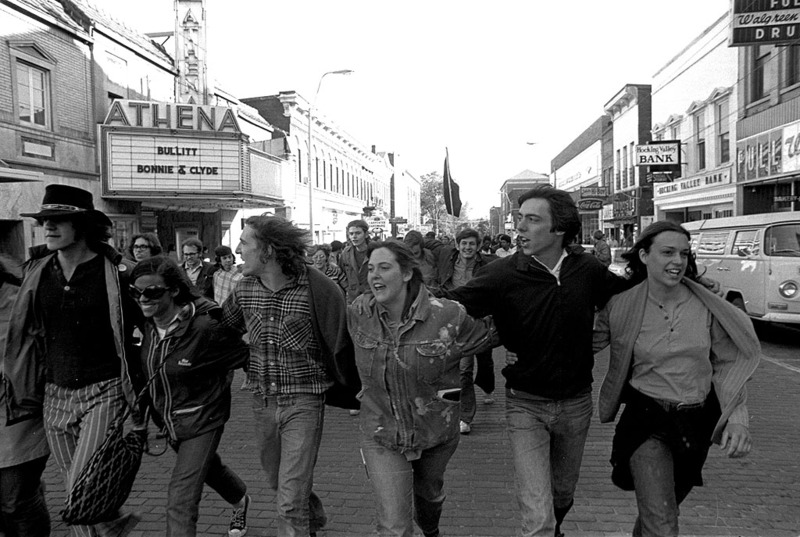 Every day there were protests and speeches, on one day we protested high prices in uptown stores singing hey hey we’re gonna have a close down, several thousand students going in stores, they closed for the day fearing shoplifting ,it was peaceful and we left. The anti war and civil rights movements came together that day ?We’ve been married 45 years this year. It was crazy times and I’m proud I protested that unjust war and unfortunately these conflicts have not ended ? The night the riots shut down Athens we found ourselves at the edge of town, streets shut down, we met these high school kids from Parkersburg who took us there, let us stay in their clubhouse, picked us up next morning and back to Athens the next day. National guard up and down the street, OU had shut down. We split to stay with my friend at Indiana University also joined by 3 of my friends from New Jersey. Couple weeks later back in Athens to get our stuff. My wife and I have lived in the Athens area ever since. 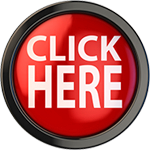 Thank You for this site and the pictures provided !! 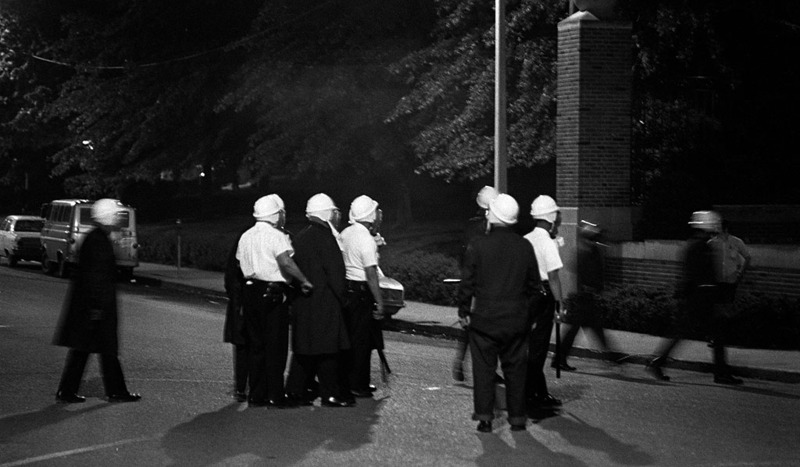 Hi Ken, I am a journalism student at OU and am doing an online multimedia project on the history of activism and protest on our campus. Could I use some of these pictures? The project would credit you for their use of course. You have an amazing trove of history and information here!